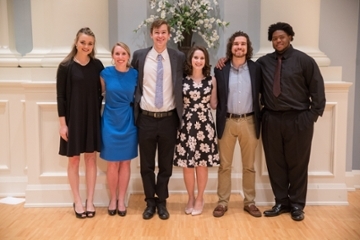 The Division of Music in Samford University’s School of the Arts celebrated the talents of students, and presented multiple awards and scholarships provided by generous patrons at the recent annual honors recital. The longstanding tradition included performances by six students, and awards presented by faculty members Kathryn Fouse, Joseph Hopkins and Eric Mathis. Student performers included Jalen Morgan, David Roby, Mary Kathryn Evans, Brooke Proctor, Samuel Robertson and Anna Taylor. Outstanding Student of the Year Award recipients are Blake Mitchell, freshman; Caleb Phillips, sophomore; Chloe Smith, junior; Brooke Proctor, senior; Matthew Grauberger, graduate studies. These students are selected on the basis of total contribution, including spirit, work ethic and collegiality. Awards include scholarships provided by numerous donors in attendance. Senior Mary Kathryn Evans was honored with the Eva Clapp White Memorial Voice Scholarship Award established by Paul Gaston White and the Northrup Scholar Award. Samford Arts patrons Jeff and Lori Northup established three awards, and Anna Taylor received the Northrup Instrumental Performance Award. Olivia Jones received the Northrup Keyboard Performance Award. These students were chosen because they represent the highest standard of musical performance. Gloria Roy, a junior from Kolkata, India, received the Shepherd-Walker Award, which is given to the music student who has graciously used his or her talent and education to enrich the lives of others. Sophomore Annesley G. Streets from Alabaster, Alabama, received the Howard Weldon Smith Violin Scholarship Award for the second year in a row, which provides an annual scholarship to a violin student majoring in music. The recipient is chosen based on both academic work and performance skills. The Barbara Stevens Price Church Music Scholarship Award was established by former Samford School of the Arts dean Milburn Price to be awarded to a church music major who has demonstrated outstanding progress in music studies in both academic and performance areas. Dean from 1993 to 2006, Price established the Honors Recital tradition. Vocal performance major Samuel Robertson was this year’s recipient. The Robert B. Hatfield Scholarship for Excellence in Music Ministry was established to provide scholarship assistance for currently enrolled Samford School of the Arts Division of Music students studying music and worship. Candidates submit essays that consider past, present and future involvement in music ministry. The 2018 Robert B. Hatfield Scholarship Award went to junior music and worship major Cole Arn from Hoover, Alabama. The Presser Undergraduate Scholar Award is presented to an outstanding student majoring in music at the end of the student’s junior year solely by consideration of merit. Sarah Harbaugh, vocal performance major with a worship leadership minor, was recognized this year. The music honor society Pi Kappa Lambda also inducted its newest members at the event: Hannah Brooke Proctor, David Roby, Anna Willis, Marissa Mayfield, Jessica Wilbanks and Elizabeth Whitmore.